Great – you’ve picked out your first egg incubator! Now, the real fun part begins. There are a number of other supplies that are helpful when it comes to hatching and raising your new chicks. These supplies are largely the same, whether you’re going to be keeping the chickens as pets and personal egg layers, or if you’ll be using the chickens for meat or reselling. Note – some links on this page take you to Amazon, where you can check the latest price and availability. There are three basic categories of extra accessories: Things that may be included with your incubator, supplies for the new chicks, and supplies for the adult chickens (if you’ll be keeping them after they’ve matured). If you’re looking for an all-in-one hatching kit that’s custom-made for beginners (it’s originally intended for use in a classroom), we recommend the Brinsea Products Complete Incubation Pack. This will give you a complete setup for 7 chicken eggs, including most of the items from this list. It’s a bit more expensive than custom-creating your own setup, but all the work of choosing has already been done for you. These supplies are generally considered “optional”, and many of the higher-end incubators may come with these pieces included. It is a good idea to have “backups” on hand just in case something goes wrong with the ones included, as well as to prevent human error with your hatching experience. If your incubator didn’t come with an automatic egg turner, or the turner included isn’t the right size for the eggs you have, you may want to invest in a separate egg turner. Make sure you read the product descriptions carefully, as turners for one model are usually not compatible with any other incubators. For best results, search the name of the incubator you picked, along with “automatic egg turner”. Most commercially-available incubators will come with a thermometer, but it may be better to have at least two, if your incubator isn’t well-insulated. Also, if you’ll be using a separate brooder (which is recommended), you’ll need another thermometer for that area. We recommend getting a digital thermometer as it will also act as a hygrometer, letting you know what the relative humidity is inside of your incubator. Baby chicks won’t be ready to go out on their own at first. While they are still young, you’ll need some supplies to make sure they’re well taken care of. A brooder is basically a safe, warm place that your chicks will be kept until they’re ready to move to a coop. Ideally, you should have your brooding area set up at least a few days before your chicks arrive – whether you’ll be ordering them online or hatching them yourself. Most people choose to make their own brooder out of a plastic tub and a brooding light. If money is tight, you can choose to use a red heat bulb hung over your brooding box, but be sure that it’s not close enough to melt the plastic or hurt your new chicks. If you want a complete brooder set-up, the Brinsea Products Larger Brooder/Intensive Care Unit is a bit pricey, but it will fit a large adult chicken in need of extra care, as well as warming newly hatched chicks. The Avianweb Chick Brooder and Enclosure Pack won’t help with adult birds, but it will help keep up to 20 chicken or duck chicks warm and confined. If you already have an enclosure of your own, the EcoGlow 20 Chick Brooder will also keep 20 chicks warm, but it does not come with an enclosure pen. While you could reasonably use a shallow dish as a waterer for your chicks, this leaves the possibility of it being dumped (if it’s not properly weighted), or will require you to clean and fill it multiple times throughout the day. Hanging bottles are another common option, but you’ll have to teach them how to drink from it, which can be quite a process. We feel that the best choice for a waterer is a gravity-feed waterer with a large capacity. They’ll still have an easy-to-drink-from dish, and you’ll have the satisfaction of only needing to fill it every few days (depending on how many chicks you have, of course). We recommend the Little Giant 1-Gallon Plastic Poultry Fount. Its easy-to-use gravity feed design minimizes the work on your part by holding a full gallon of water per fill. As with the waterer, a chick feeder is an “optional” accessory. You could feed your chicks from a dish. But you’ll need to fill it regularly, and they may climb inside and make a mess. A good chick feeder will have multiple holes, so that all your chicks can feed easily at the same time. It should also have a screw-on gravity feed area. It may or may not include the container to hold the “refill” food. We love the Miller Manufacturing 9810 because it’s inexpensive, takes a standard quart-sized mason jar, and has rolled edges to keep your chicks from hurting themselves. From a basic nutritional standpoint, chicks can eat regular chicken feed, usually with no problems. However, starter feed contains extra protein, vitamins, and minerals to help them put on weight and muscle. Not only does this help get your chicks get off to a great start, it’s also not a bad idea to keep some on hand for older chickens, as it can also help if there are specific weight and muscle related problems with a particular chicken, such as after illness or injury. For those interested in eating or reselling their chickens, starter feed is often used to plump adult chickens. Our favorite starter feed is the Coyote Creek Certified Organic Chick Starter. It is a little expensive (mainly in the shipping department), but this is a 20-lb. bag of starter feed – plenty to last until your chicks grow up. If you would prefer to start with something smaller, a 5-lb. bag of Manna Pro Chick Starter is another high-quality choice, although it is more expensive in the long run. Coyote Creek Organic Feed Mill and Farm - Misc. If you’ll be keeping your new chicks once they’ve matured into adult chickens, you’ll need a chicken coop, as well as chicken feed (unless you’ll be keeping them on starter feed). The best chicken coops are usually hand-made, although there are commercially-available kits available, too. 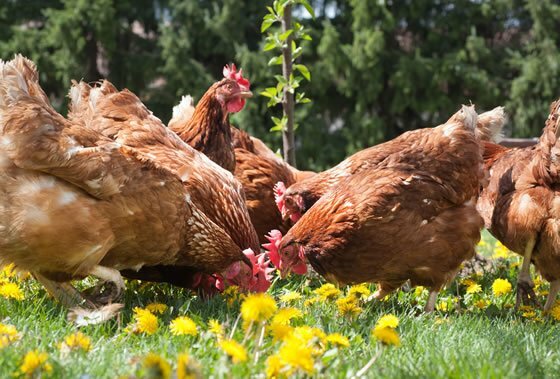 The chicken feed you choose to use will depend on your budget and your chickens – it’s most important that they’ll actually eat it!